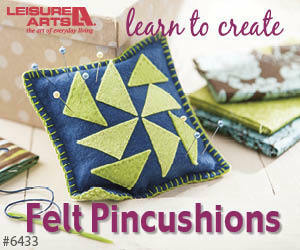 In this episode of Telecast Thursday I'm going to show you how to create four half-square triangles (or half square triangles, whichever you prefer) from two pieces of fabric. Okay, maybe this also sounds like a magic trick and it really does work like magic, but it isn't. Sorry to disappoint you but there isn't any real magic in quilting (just like no crying in baseball!). You'll need two pieces of fabric the same size and I would suggest that there is a contrast between the two fabrics to get the appropriate effect. Two fabrics the same colour doesn't work very well and you'll just up with a pieced square. I'm using charm squares in my demonstration, but any size of square will work, but the pieces do have to be square. Rectangles and triangles just won't do! To see how simple this technique is, watch the video below or on my YouTube channel. Do you have an amazing way to create half-square triangles? Tell me about it in the comments below. Next week I'll give you another way to create even more half-square triangles, so be sure to check back next Telecast Thursday.